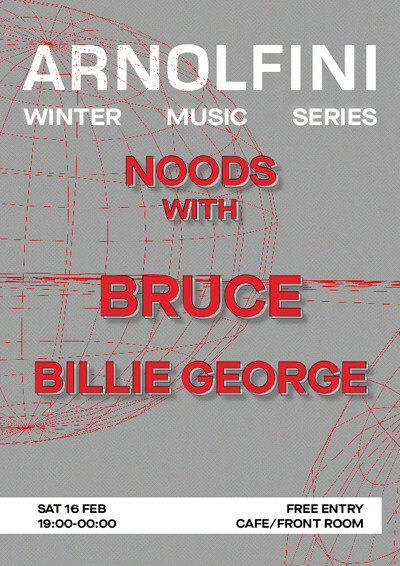 Local heroes of internet radio NOODS team up with Arnolfini to present the next installment in the art house's Winter Music Series. Local heroes of internet radio NOODS team up with Arnolfini to present the next installment in the art house's Winter Music Series. With up and comer Billie George warming up for Bristol legend BRUCE...and a cheeky slot from DJ Ductape at some point during the evening : there shall be dancing. Larry McCarthy creates postmodern rhythmic drama at the burning intersection of UK dance music. Bruce's music operates at all speeds without any predictable formula. Some tracks stutter and thump with cybernetic power; others flutter and glide in poignant shades of blurring colour. It’s a fragmented, low-frequency meltdown, evocative shimmers of light emanating from the cracks. Sometimes what you're listening to is suddenly scraped off and wiped away, leaving only silence as you blink in disbelief. With a deep understanding of tension and release - essential for thrills and head-spins - McCarthy has been a fundamental force in the continuing output of the pioneering label collective Hessle Audio since his 2014 debut. Since its inception, McCarthy has been also a close affiliate of the Timedance label, where he’s continued to expand his sound, along with Livity Sound and Hemlock. McCarthy’s hyperactive and surreal humour allows him to recreate the process of converting experimental abstraction into exhilarating energy when he’s performing as a DJ. His nuanced dancefloor approach has already taken him on tour as far as the US and Japan. He further explores his own marriage of heartfelt music and daft humour via his monthly Noods Radio show, ‘Get Loose! With Bruce,’ coyly lassoing together various sonic phenomena that inspire his music. Having recently been described as the ‘bounciest DJ in Bristol', Billie George has begun to make a name for herself with her genre bending sets. A resident DJ for Minotaur Sound, she’ll also be kicking off residencies on Noods and 1020 this year. If DJ Ductape was a dinner they would be bubble & squeak.